We probably should have known that the bumbling Jean-Claude Junker was neither the brains nor the primary driver of European Union policy. No, the puppet master is Martin Selmayr, now Secretary General of the European Commission, formerly a German civil servant. He is described as the most powerful and feared individual in Europe. He’s played hardball with Britain, making an exit from the EU all but impossible, demanding 39 billion pounds as the price of withdrawal. He’s described as fervently anti-American. He’s dead serious about an EU army. He was instrumental in the deal that handed Germany the leading role in the European Union. Even members of the European Parliament are fearful of this guy, and are afraid that he has taken over. He intends to make of the EU the kind of supranational/globalist entity, the United States of Europe that sounds very much like the kind of power foretold in Bible prophecy. He was the individual behind what has been called the German takeover of Europe and its institutions. His grandfathers on both sides were generals under Hitler. No wonder Brexit hit a wall. A NOTORIOUS Eurocrat has declared that No Deal Brexit is “not the end of the world” as Brussels braces for Britain to crash out. Selmayr has a reputation for behaving like a bull in a China shop. With the risk of no deal looming, one can only wonder why Ireland, the Benelux, Germany and France – who are risking a lot of damage, for which they are insufficiently prepared – tolerate a hardliner in charge who’s making this prospect more likely. 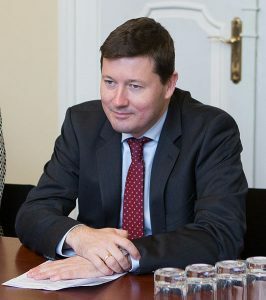 When it comes to Brexit, Martin Selmayr has been regularly accused of complicating the negotiations unnecessarily. British officials have accused him of wanting to ‘punish’ the UK for leaving the EU, which he apparently considers to be a ‘tragedy’ that will, however, re-energise the European project as a case study in the essential value of the Union. “He was put there very much by Jean-Claude Juncker, he’s known as the beast, he is a total EU fanatic. Last year, Der Spiegel ran the headline The Most Powerful Bureaucrat in EU History? about him. We see that Martin Selmayr rose to power in a way that many think should not have been allowed to happen in the EU. And yes, the UK will end up being terrorized by what will rise up in Europe. This entry was posted on Saturday, February 9th, 2019 at 8:45 am	and is filed under Prophecy.